Welcome to the Library and Resource Centre information page. You will find useful information here that will help you get the most out of the service. Just use the handy headings below to find the information you need. How do I borrow from the Library and Resource Centre? 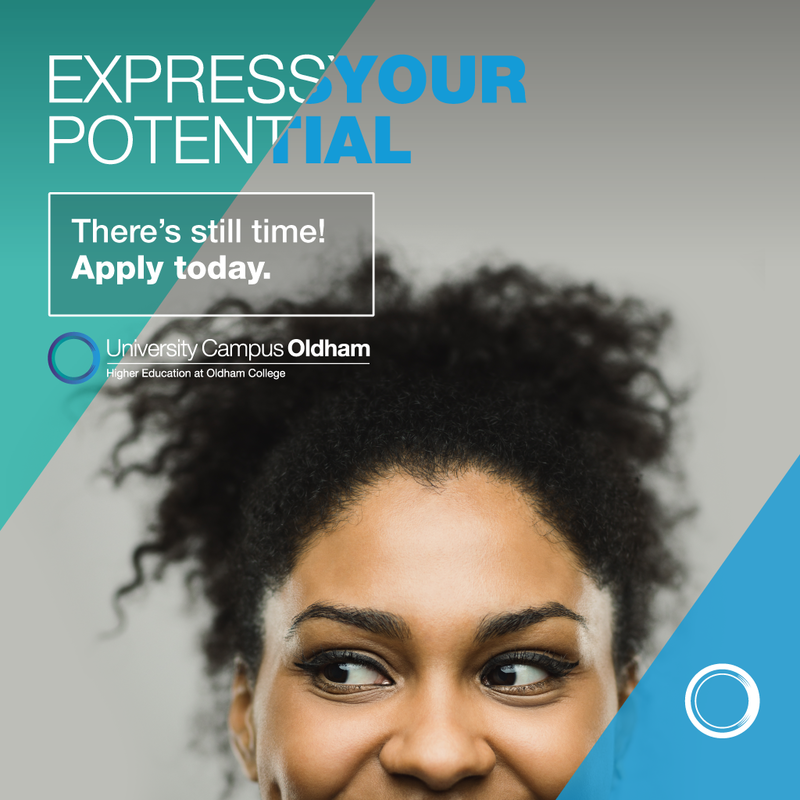 All you need to borrow is your University Campus Oldham ID card. Please make sure you carry it with you when on campus. University Campus Oldham Library has course relevant material in a range of formats. You can borrow DVDs and a range of equipment such as laptops, wireless presenters, voice recorders and memory card readers. Print journals are for use in the LRC only. How long can I borrow items from the Library and Resource Centre? Most of our books are either standard loan, which is three weeks, or one week loan. The different loan types are clearly labelled, but if you need clarification just ask. You will receive the due dates of your books when you borrow them, either stamped in the book by a member of staff, or on the receipt from the self service machine. You can check the due dates of your items via the library catalogue. A number of books are reference, which are for use in the LRC only. Most equipment is issued for one week. Please ask a member of staff for further information. Yes, as long as a book is not reserved by another user. Phone: By ringing us on 0161 344 8888 during opening hours. If you ring while we are closed, you can leave a message with your student number and a contact number, and we will get back to you once we have re-opened. In Person: Call in to the LRC and use either the self-service machine or ask a member of the LRC staff at the support desk. How long can I renew them for? A standard loan book will renew for three weeks from the date you make the renewal. A one week loan will renew for one week. Once you’ve reached your maximum number of renewals, you can bring the book back into the LRC. Please note that renewals are not guaranteed. Your items may be reserved by another user at any time. Can I renew other items, like laptops? To renew a laptop, you need to bring it in person to the LRC. If there is not a waiting list for laptops, we will be able to renew it for another week. Please be aware that laptops are very popular, and fines are charged at £10 per day if they are overdue. Yes. Items that are returned or renewed after their due date will be subject to a daily charge. Standard loans are charged at 20p per day. One week loans are charged at 50p per day. Laptops are charged at £10 per day. All other equipment (cameras, recorders, presenters) are charged at various rates, please ask a member of staff for details. We do not enjoy charging fines. But they are there to make sure that people bring things back in time, to allow other students to borrow them. The daily charge for laptops might seem like a lot, but they are expensive pieces of equipment and very popular amongst our students. I’ve got a fine. How do I pay? Payments by cash must be made in person. Cheques should be made payable to ‘Oldham College’ and sent to: University Campus Oldham Library and Resource Centre, University Way, Oldham, OL1 1BB. If you have incurred a large library fine or have been invoiced for a lost item and cannot pay the charge in one go, we can arrange payment in instalments. Just ask a member of staff for further information. What happens if I want to borrow something that you do not have in stock? We will try to borrow any item you request from the British Library. We can also request articles from journals; theses; some newspapers; conference proceedings and technical reports. There is a small non-refundable charge for this service (£2). All you need to do is complete and sign a short form and we will do the rest. You can use any of the self-service printers in the by scanning your ID card or logging into the printers manually. All printers print in colour or black and white, all we ask is that you have enough credit on your account. All PCs are linked to the printers on the follow-me system. Please see section on copyright for further details on copyright regulations. You can top up your print credit account using cash at either the self-service print kiosk or at the LRC support desk. We have a self-service photocopier. You will need to have enough credit on your account. You can top up your print credit account using cash at either the self-service print kiosk or at the LRC support desk. ​Copyright – What is copyright and what do I need to know? Copyright is a form of intellectual property right which is implicit in the creation of anything original, including literary works, paintings, photographs, films, and television programmes. Its purpose is to define and protect the legitimate interests of copyright owners and, indirectly, to ensure that they receive suitable acknowledgement and, where appropriate, payment for the use of their work by others. Please be aware of copyright regulations when printing/photocopying or scanning documents. Clear notices regarding copyright are displayed next to every printer/photocopier and have much more detailed information on them as regards how much you are able to legally copy. ​Do you offer a binding service? Stationery We sell a variety of stationery – please ask at the LRC support desk to find out what is available. Pick up a card from the LRC entrance and post into the comments box.